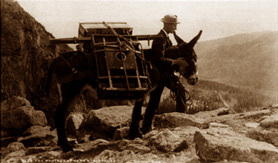 As the Western United States was being surveyed, colonized and developed concurrent with the invention of photography and continuing until the onset of World War I, many skilled commercial, professional and artistic photographers were documenting railroad construction, cowboy life, mining scenes, architectural views of cities and settlements, portraits of outlaws, lawmen, and frontiersman, natural wonders of the landscape and views of Indians and Indian life. Their photographs appear in albums, as singular daguerreotypes of the gold rush, and in stereocards, cdvs, cabinet cards, imperial and rare mammoth views. As early as 1841 Edward Anthony was hired to make daguerreotypes of certain lands and hills which were being surveyed as part of the Northeastern (Canadian American) Boundary. By the late 1840s and early 1850s there were many skilled daguerreotypists working in the West, often as part of government expeditions. They included Thomas Easterly and John Fitzgibbon who photographed Indians. Isaac Wallace Baker, Frederick Combs, William Herman Rulofson, William Shew and Robert H. Vance who photographed the gold rush. Solomon Nunes Carvalho photographed on Fremont’s Fifth Expedition, John Mix Stanley on the I. I. Stevens expedition, and W. C. Mayhew worked with Sitgreave’s expedition. Most of this work has never been found. Albums and individual prints by George R. Fardon of San Francisco from the mid 1850s of San Francisco are among the rarest of work from this period. Photographs taken of Indian Delegates in Washington, D.C., New York, as well as images of Indian and frontier life in the western territories were an extension of the tradition of illustrators and painters who traveled with earlier exploration parties. Regarded as scientific documents, photographs were uncritically accepted as the medium that most truthfully portrayed the character of native peoples and their traditions. This took on additional importance as Indians came to be perceived as a “Vanishing Race.” Photographs of Indian delegates visiting Washington, D.C. from the West began in earnest at the James McClees studio in Washington in 1857-1858. During the Civil War most of the photographs of Indians had been taken out West. But by 1868 there was a resurgence of interest in photographing Indians both in Washington as well as in the West. Indian photographs became more avidly collected and commissioned thanks to the efforts of Ferdinand V. Hayden who headed the Hayden Geological Survey, and through the patronage of William Henry Blackmore, English land speculator in the American West, who not only assembled a group of photographs taken by numerous western photographers but who also commissioned such as that of Alexander Gardner to photograph Indian delegates in Washington in the early 1870s, in an effort to create a survey of all the Indian tribes. E. O. Beaman (1837-1876), John Hillers, William Henry Jackson, and Timothy O’Sullivan also photographed in the field for the government surveys. Charles Milton Bell (1848-1893) who worked from his Washington studio making single portraits and group views ranging from 5 x 7 inches to mammoth plate size. He also made views in other locales, such as the steps of the Capitol Building. Gardner, Alexander, b. Paisley, Scotland, October 17, 1821; d. Washington, D.C., December 10, 1882 Alexander Gardner is best known for producing major photographic documents of the Civil War and of the American Indian. In Scotland Gardner trained as a jeweler, helped fund a utopian community in Iowa, published a newspaper, The Glasgow Sentinel, and was a skilled photographer before moving to Washington D.C. in 1856. Working with Matthew Brady, Gardner excelled at the making of large wet-plate collodion negatives. Additionally, he was a skilled businessman and by 1858 was placed in charge of Brady's Wash­ington, D.C., studio. He was one of Brady's Civil War photographers before setting up a competing studio and business in Washington D.C., he brought along some of Brady's best photographers, including Timothy O’Sullivan. Gardner himself became an official photographer for the Army of the Potomac. Gardner’s background as a newspaperman and familiarity with the photographs of the Crimean War propelled him to a documentary style of photography and publishing. His made a substantial body of portraits of Abraham Lincoln and other important prominent citizens, politicians, and military men. In 1866 he published 100 original prints, in two volumes, as Gardner's Photographic Sketch Book of the War, with photographs taken by Gardner, O’Sullivan and others, all who were given their individual credit. His views of the Lincoln conspirators became one of the first eyewitness photo journalistic articles when published by Harper’s Weekly in 1865. From 1867 -1868 Gardner was the official photographer for the Union Pacific Railroad, Eastern Division, and documented scenes of life and landscape along the U.P. lines in Kansas and westward to San Francisco. Here the photographs served to booster the claim by the Railroad on the ease of constructing a Southern route and developing the land. He was one of the most important photographers of Native Americans. In 1868 he was commissioned to photograph the treaty negotiations between various Northern Plains tribes and the U.S. Government at Ft. Laramie, Wyoming. Gardner, who first photographed Indian delegates while working for Brady in the 1850s, continued this work after the Civil War. Most of the work was commissioned by William Henry Blackmore to photograph Indian delegates between 1866 and 1873 and a small number were published in albums produced by Blackmore for his Salisbury Museum (U.K.) and Ferdinand V. Hayden under the auspices of the U.S. Geological Survey in the 1870s. Jeremiah Gurney (1812 - 1886) & Son, known for daguerreotypes, had a very early and long-lived studio in New York where visiting Indian delegates were photographed. This work is extremely rare. McClees Studio Washington, D.C. (1857-1860): Julius Vannerson (1827 - ?) and Samuel Cohner were operators who printed first as salt prints. One of the first studios to market views. Addis Gallery was a successor to the McClees Studio in Washington, D.C. (1867 – 1869). The camera operator and manager Antonio Zeno Shindler (1823-1899) made views of delegates visiting Washington reprinted from earlier McClees Studio negatives. He also made prints from other negatives collected by Blackmore, as well as copy negatives of earlier Indian prints and daguerreotypes. Albumen prints ranging in size from carte de visite to app 14 x 20”. Ulke Borthers (Henry, Julius and Lee) had a studio in Washington, D.C. where they made a series of delegation portraits. There were also a number of photographers in the West who worked out of studios and traveling studios. They photographed White people and frontier settlements, as well as the Indians. Often, after making a portrait of settlers or railroad workers they would clean their wet plates and re-coat them for the next customer. There were good business opportunities for a small group of adventurous and intrepid frontier photographers who complied stocks of photographs to support the booming national and international market for views. Among these notable photographers was Joel Emmons Whitney (b. 1822 Phillips, Maine; d. 1886, St. Paul, Minn.), active from 1850 to 1871 in St. Paul. He made salt print portraits, cdvs, and albumen prints of subjects ranging from the condemned Indians from the Minnesota Massacre, to views of waterfalls and Minnesota settlements. His partner was Charles Zimmerman (b. 1854?, France; d. 1909) of Minneapolis and St. Paul. William H. Illingsworth (b. 1842, England; d. 1893, St. Paul, Minn.) photographed Custer’s expedition to Black Hills in 1874. Orlando S. Goff (b. 1843, Moodus, Conn; d. 1917, Idaho) traveled through various towns in the Dakota Territory photographing Indian and pioneer life, as did Edric Eaton in Omaha. W. G. Chamberlain from Denver worked from 1861 into the 1880s made many early notable views of towns, mining scenes, and Indians. B. H. Gurnsey (b. 1844? New York; d. 1890) worked in Iowa and Colorado Springs best known for his Indian views. John Carbutt from Chicago made railroad views. Hamilton with various partners and individuals named Hamilton (C.L. Hamilton, J.H. Hamilton, Hamilton and Hoyt, Hamilton and Kodlylek) and studios in Nebraska and Iowa. Charles Savage (b. 1832, Southampton, England; d. 1901, Salt Lake City, Utah) began photographing in Utah in 1859. He made scenic views, and views of the joining of the rails at Promentory Point, early views of Mormon settlements. His studio burned in 1883 so his earlier work is rare but he did continue to photograph until his death. Charles Carter (b. 1832 London; d. 1918, Midvale, Utah) worked from 1863 to 1906 out of Salt Lake City, along with G. M. Ottinger. Orloff Westmann from Elizabeth Town, New Mexico who did work for Blackmore in Taos in 1871. George C. Bennett (b. 1846?, Vt; d - ?, was in partnership with (William Henry) Brown and his father Nicholas Brown in Santa Fe making many early Southwestern Indian views and views of towns and ruins. One notable body of work from this period is from the Canadan American Boundary Survey which included salt prints taken between 1858 – 1862. There was a large trade in scenic, mining, portrait, and architectural views. In California, foremost among the studios were Lawrence & Houseworth / Thomas Houseworth & Co., Bradley and Rulofson and Isaiah Tabor (1830-1912). Tabor took and commissioned photographs, purchased Carleton Watkins views in 1870, and published his and other scenic views of California, Yosemite and the west in formats up to mammoth plate size. Houseworth and Rulofson distributed Muybridge’s work, among other photographers. Charles Leander Weed (1824-1903) worked in Yosemite and in Japan. His early mammoth plate views of Yosemite, rivaled only by those of Watkins and Edward Muybridge.